Focus group interviews with student participants during the final weeks of the REU program. A brief description of assessment results follows. It should be noted that some assessment activities from 2017 are in progress. The Back to the Future REU program has supported a diverse group of students from 25 different states plus Puerto Rico. 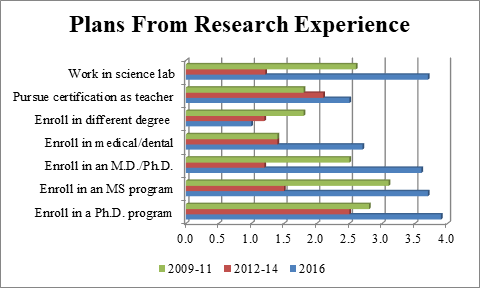 Figure 1 shows the home university program of the 91 students who have been served by the program thus far. All students participating in the REU program were given the opportunity to complete the Herrmann Brain Dominance Inventory (HBDI). Interest in this instrument is two-fold. First, does the REU program attract students with a stronger analytical thought process or does it attract an intellectually diverse group of students. The latter may be an important consideration for some areas, particularly if there is a strong interest in under-represented populations. A second interest in this instrument is to determine if the level of satisfaction with the REU experience is dependent on the thinking preference typology. Focus group interviews for the summer 2009 through 2014 did not indicate any degree of correlation between a student’s typological profile and level of satisfaction. Results from the HBDI for 2016 and for participants through the entirety of the program are shown in Figure 2 below. Figure 2(a) shows the combined team composite for REU participants for 2016 only. 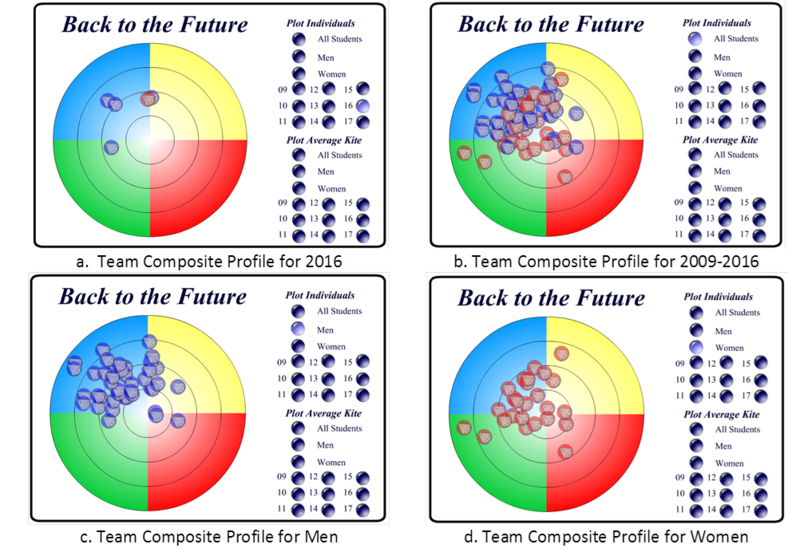 Figure 2(b) shows the team composite for the seven years the program has been offered (2009-2016). The blue circles denote typological preference for the men and the red circles denote the typological preference for the women. Figure 2 shows that, on average, REU participants have a stronger leaning towards an analytical (blue) thought process. However, it is also clear that the program tends to attract a fairly intellectually diverse group of student researchers. This is commendable since this is atypical of engineering education in general. The composite typological profile for men is shown in Figure 2(c) and the profile for women in Figure 2(d). This shows that male participants tend to be more comfortable with analytic thought processes whereas women tend to enjoy engineering and design more if it has an societal impact. A common perception is that students exhibiting a right brain profile are less likely to pursue engineering or science and there is some campus data to support this perception at the undergraduate level. While women participating in the REU tend to be more analytic than the general population, it is also true that their typological profile is shifted downward and to the right. We would like to conduct a final survey of current and past participants next summer to determine if typology does make a difference. From 2009-2016, we saw no significant typological differences between American Indian researchers and the general body. We did, however, see significant typological differences between male and female researchers. The data shown in Figures 2 is a flash file with an attached database. The database is updated with each subsequent REU program. Consequently, all plots composites and average kites can be explored on the fly. Currently this file is maintained at http://skellogg.sdsmt.edu/HBDIREU.htm. The Undergraduate Research Student Self-Assessment is an NSF sponsored inventory specifically designed to address a number of issues of interest to undergraduate research. The site is maintained at the SALG site ( http://www.salgsite.org ). A total of 7 students completed the URSSA SALG inventory in 2016. Question 1 related to average gains in thinking and working like a scientist. Specific questions and average response scores (l=no gains, 5 = great gain) follow. 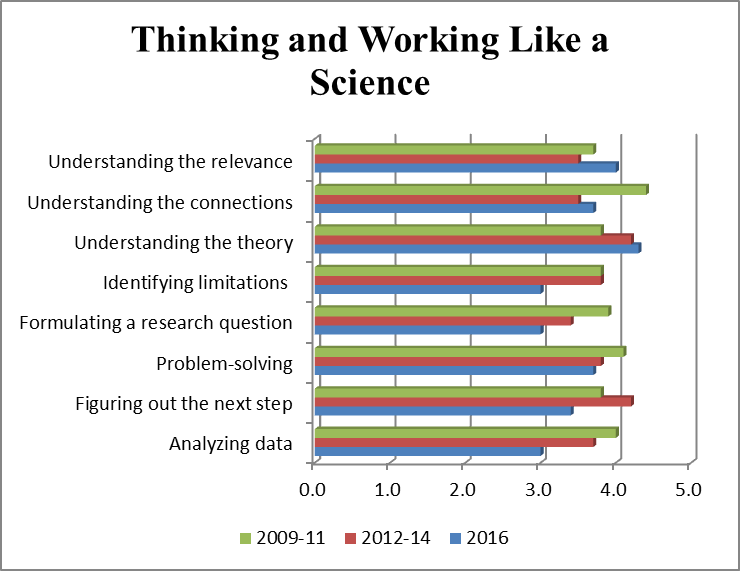 Figure 3 below shows perceived gains in 2013 in thinking and working like a scientist as a result of the REU experience. Question 2 responses relate to personal gains related to the research work. Figure 4 below compares the average response for each item in question 2. Question 3 relates to perceived gains in personal skills related to scientific research. 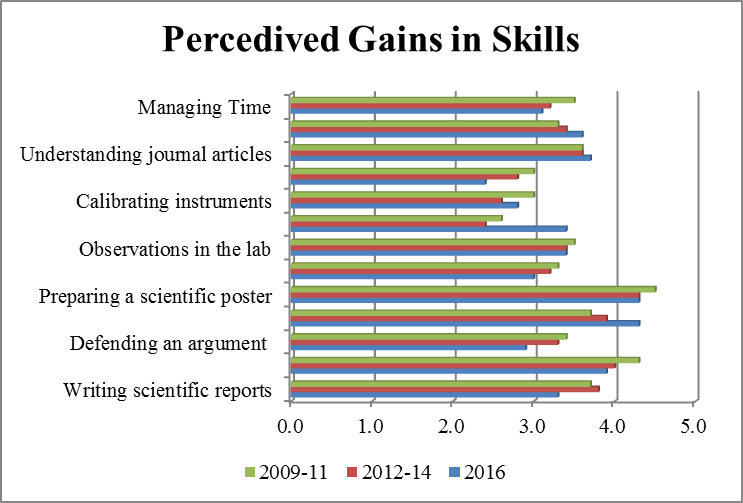 Figure 5 below shows perceived gains in scientific skills for 2009-2011, 2012-2014, and 2016. Question 5 of the SALG survey relates to changes in attitudes or behaviors as a result of participation in the REU experience. 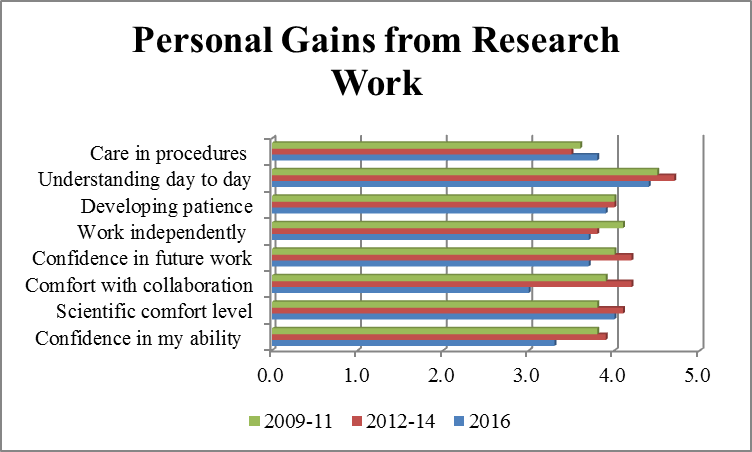 Figure 6 below shows a weighted average of changes in attitudes for all participants in the 8 year REU program. 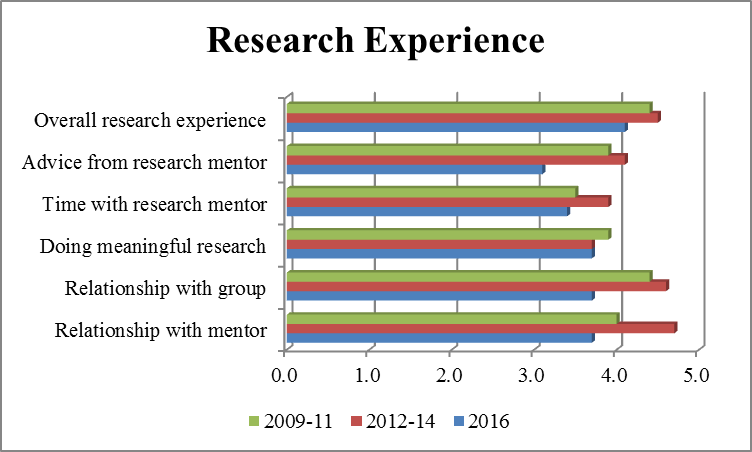 Figure 7 below provides a summary response for REU participants for overall research experience for 2009-2015 (1=N/A, 2=poor, 5=excellent). The two remaining questions tabulated from the URSSA are questions 7 and 8 related to the overall research experience. Average response scores are shown in Figures 8 and 9 below. A focus group is conducted near the end of each REU session. Over the past year as well as the previous years of the Back to the Future REU program, research participants have been generally positive about the program. For most participants, positive aspects of the program include their relationship with the faculty mentor, the social connections built into the program, the professional development activities (particularly the graduate school seminar). Students stressed the value of being co-located in the dormitory with other students and found the collaborative aspects of several REU’s and the social connections to be very beneficial. One of the queries made during the focus session includes their thoughts about research and pursuit of the graduate program. 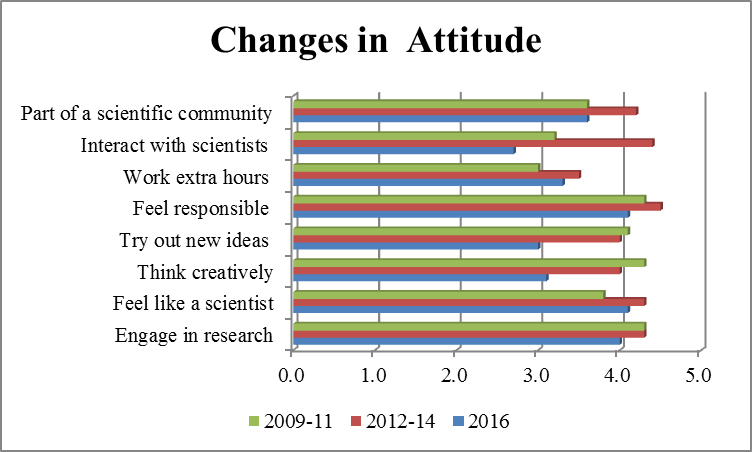 As in most years opinions vary slightly and in particular, in past REUs to be more disjointed on the overall impact the REU has had on overall attitudes towards graduate school. 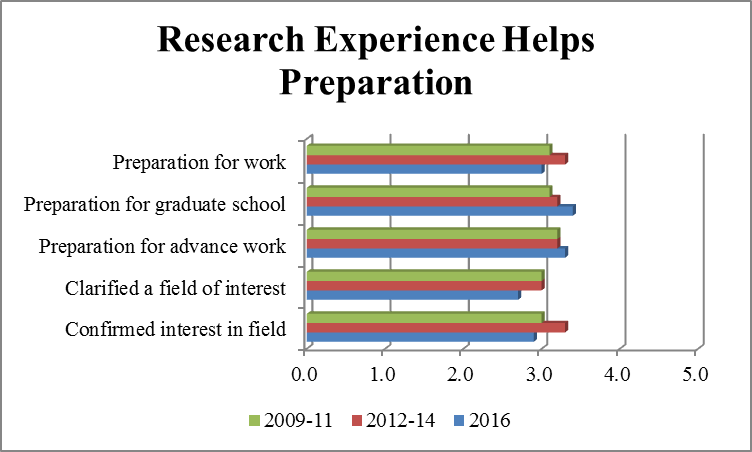 Students in the Back to the Future REU in 2016, however, seemed to be more positive towards the aspects of graduate school and eventual enrollment in a Ph.D. program than they had in recent years. Comments were consistent with overall attitudes about research (Figure 9).